The Cathode Ray Tube site, Cathode Ray Tubes. 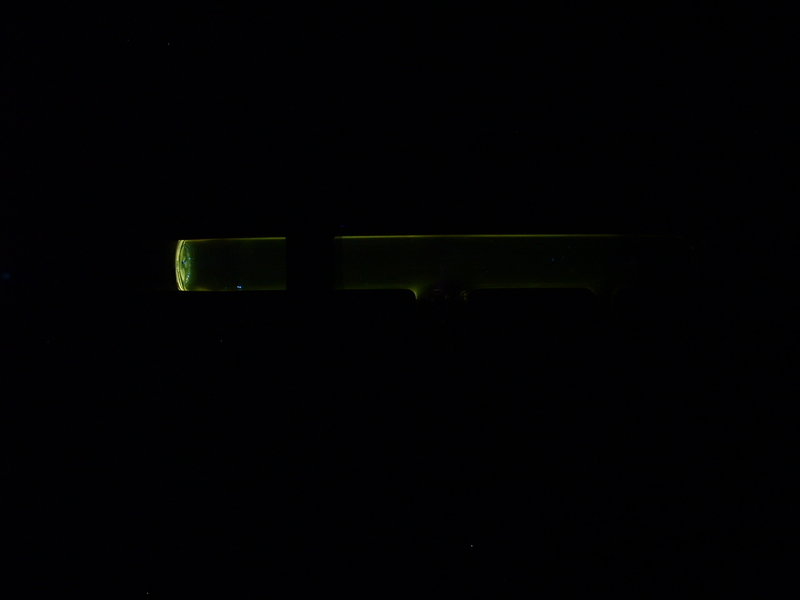 The Braun tube, this small early 1900 tube is in fact a cold Cathode Crookes tube with an internal mica screen covered with phosphorescent paint. 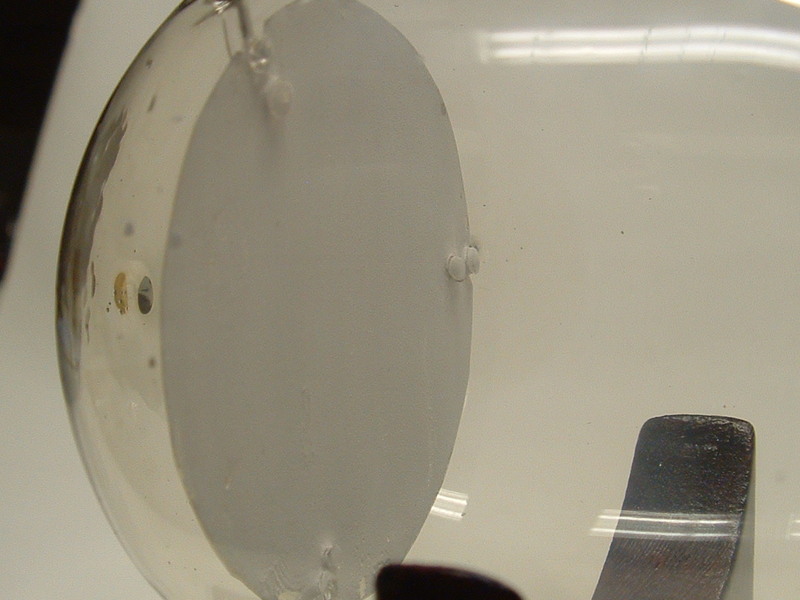 The neck contains a glass diaphragm with a small 2mm hole to let only a tiny electron beam go through (focus) which can be deflected by an (electro) magnet to produce a spot on the screen. Click here to see the family of educational CRT's sold by Max Kohl early 1900 and here by Müller-Uri. 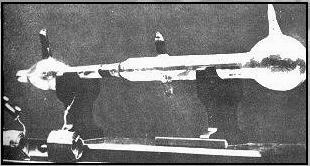 Click on the picture to see the original tube in The Cavendish Lab at the University of Cambridge. The beginning of the CRT Century which would last more than 100 Years! Gladitz GmbH, Fernseh AG, Radio AG, D.S.Loewe, Baird Television, Marconi-EMI and Cossor. 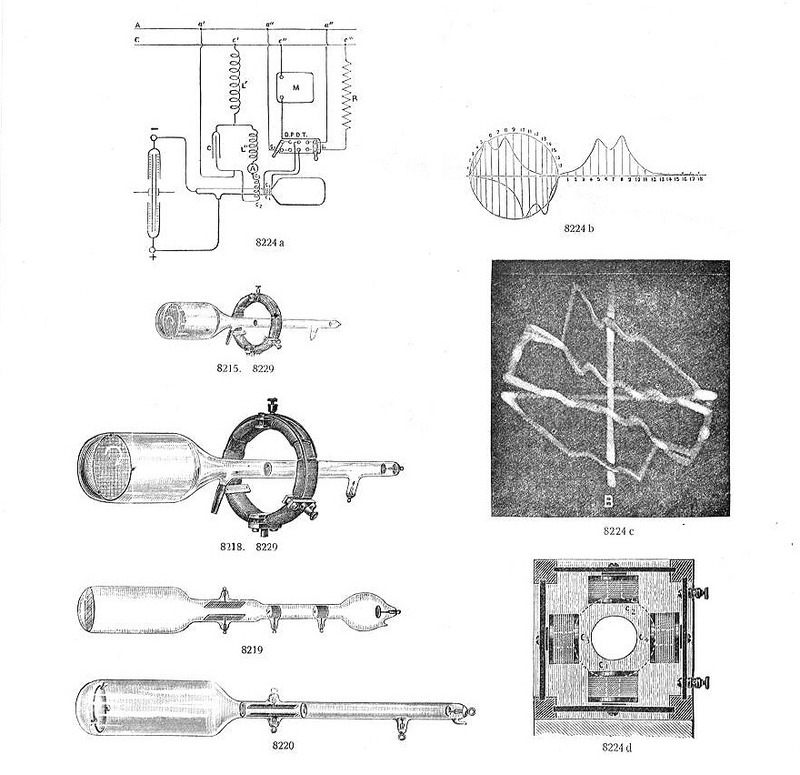 had also long reputations in early science vacuum tube technology. 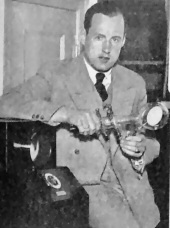 Farnsworth Television, and Dumont developed their pre-War CRT's. focus of the beam was regulated by controlling the heater current like the Western 224.
for Westinghouse (part of RCA) was the high vacuum RCA 906.
different and better tubes for TV, radar and oscilloscopes. receivers, this CRT's were called Oscillite which never became successful like the RCA tubes. this could be done by placing the gun under an angle pointing towards the side of the tube. in the deflection amplifier circuits for tubes with large screen sizes. were used with 40 lines flyingspot scan techniques, the camera tubes were not yet developed. produced the first domestic TV sets for the Japanese market. With the increasing TV market, mass production of CRT's was the result. 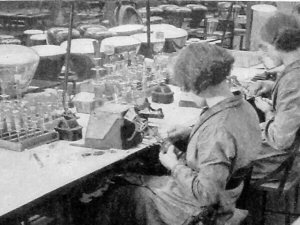 These pictures above are from the Philips tube factory about 1947. This tube with a hollow face to prevented picture distortion on a 40 x50 cm screen. 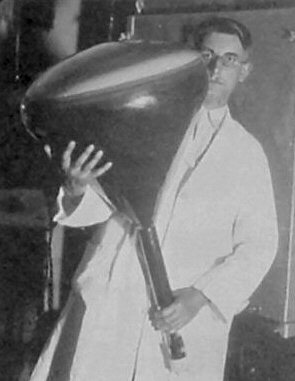 This is a 31cm TV tube from 1937. DW means double electrostatic deflection. The W stands for white phosphor. Due to distortion problems with bigger tubes Philips developed small projection CRT's. CRT's with screw connections on the base. 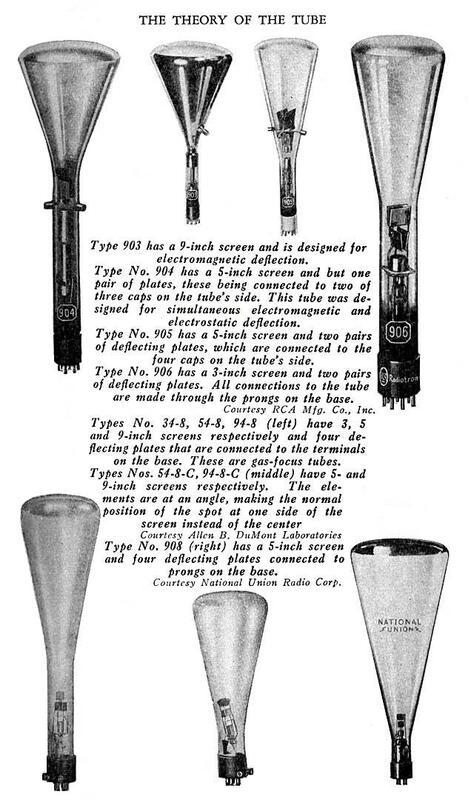 Type AH and BH were sold in 1934 used in the first 30 lines TV receiver. 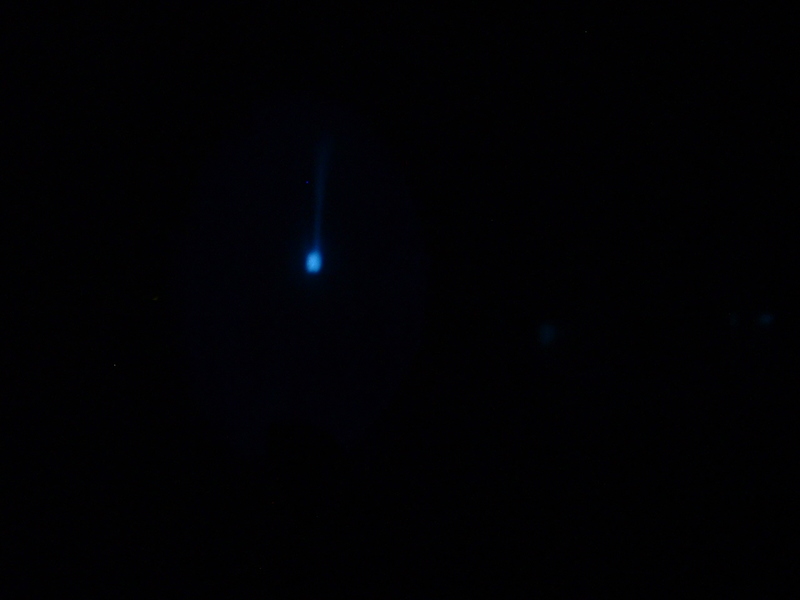 times lighter than the hydrogen atom and called electrons. science and the development of Cathode Ray tubes. European country's is still Braun tube. Collection of Radio-AG D.S Loewe CRT's 1937. Electrostatic deflection for projection use. Click on the pictures for the original German documentation from Gundelach and information about the Fernseh AG Company. From this fine web site. 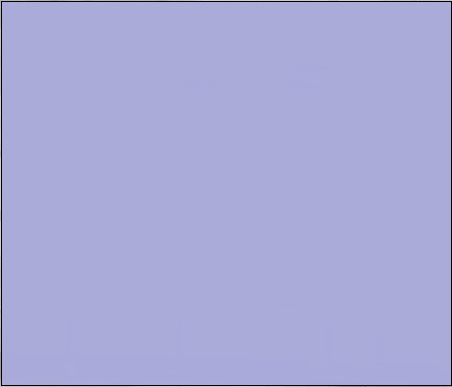 Foundation for German communication and related technologies. 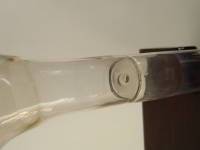 A German physicist working at the Physics Institute of the Strasbourg University (from 1895-1918) developed the first cold Cathode Ray tube with magnetically beam deflection.He used a diaphragm and a mica screen covered with phosphor to produce a visible spot. 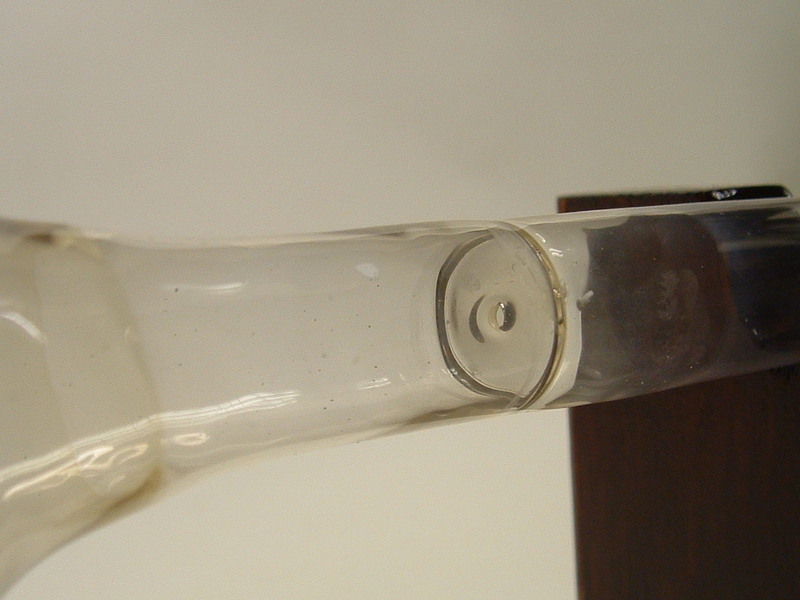 The principle was based on the Crookes deflection tube. 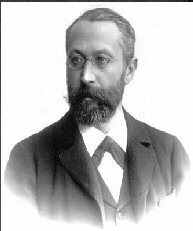 This tube, build for him by Franz Müller, successor of Geissler was called after its inventor, the Braun tube. 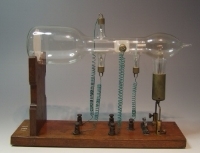 Braun used this tube as an indicator tube to visualize alternating currents and described this in 1897, it was in fact the first oscilloscope. 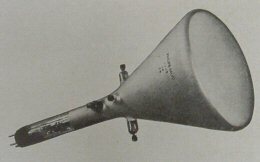 Harris J Ryan introduced a similar tube in 1903 in the USA as an alternating current wave indicator, known as the Braun-Ryan tube. 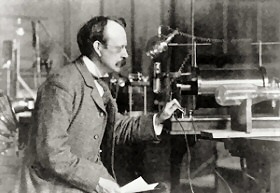 The first ideas of using Cathode rays (Braun's tube) for Television came from the Englishman Campbell Swinton in 1908. 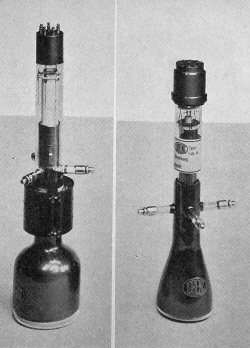 The Frenchman Rignoux and the Russian Rosing experimented also with the Braun's tube for the same reason, just like Belin and Holweck who used Cathode rays for their TV receiver and demonstrated it in Malmaison in 1928. At that time, mechanical TV was the only way to transmit moving images. A biography of Braun can be found here. From the 1930's on, electronic TV developments started in Europe and the US, many companies produced series of electronic TV sets more than 25.000 sets were produced in the US when the War stopped the production. 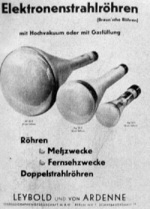 From 1935 the developments in Germany were under strict orders from the Nazi regime, in march of that same year the Fernsehgruppe Paul-Nipkow started their first TV Broadcasting with the Von Ardenne mechanical camera system using film, and later also with Iconoscope cameras at the Olympic Games in 1936, using techniques with permission from RCA and Farnsworth Television. Companies like Loewe AG and Lorenz AG were held under rigorous military control and Von Ardenne joined like many other German scientists the Nazi regime. From 1939 the TV manufacturing in Germany stopped completely due to the beginning of the War. German Nazi Television, only limited to Berlin for fifty high placed persons and a few public TV places called Fernsehstubes for the propaganda TV. In 1943 after the bombings on Berlin the surviving TV equipment went to occupied France where the Germans built a new TV studio in Paris at 180 Rue de l'Université with the name "Magic City". It was completely built by Telefunken A.E.G and Fernseh AG, and was used until August 16 1943 when they took all equipment back to Germany. Look here for an interesting Dutch television documentary about recently found (1999) original Nazi film-for-TV footage. In Britain John Logie Baird was the first to experiment with television, he moved with his company in 1933 to the Crystal Palace in London. The first public TV BBC Broadcasting started in London on the 2nd November 1936 in the Crystal Palace facility, then Europe's largest TV studios, home of the Baird television company using mechanical cameras. 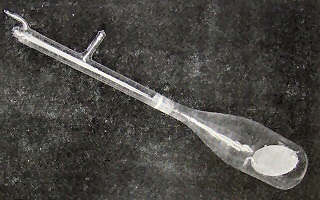 Although the Baird company had connections with Farnsworth, their Dissector pickup tube was not used due to its poor light sensitivity. The Crystal Palace burned to the ground on the 30th November 1936 but Baird's CRT production plant housed in the same building was spared. After the fire the BBC banned Baird's mechanical camera system and was replaced by the Marconi-EMI all electronic system. (EMI had license cross-connections with RCA) During WWII, the TV production in the US and UK stopped almost completely, development of radar and oscilloscope techniques for the War industry had now more priority. You can find more info about early British television on these fine web sites Baird's Independent Television and Baird Television. See also the Camera tubes page. 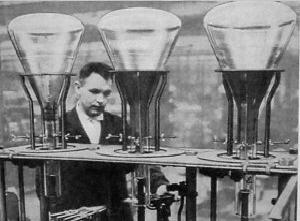 In the first production of thirty tubes the screen was placed under an angle for better viewing. 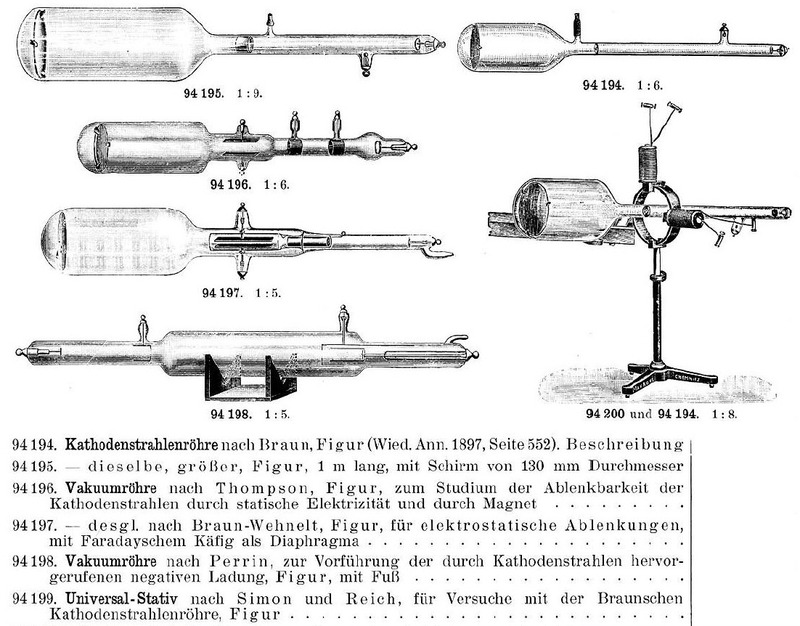 Look on this page for great historical didactic tubes like the Thomson tube. Click here for the new special pages dedicated to the closed last CRT factory in Europe. Glowlight oscillograph tube Max Kohl. ca1910 on original stand. 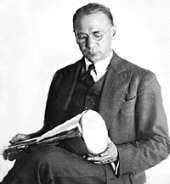 The first kind of oscillograph, it worked with a rotating mirror system after Gehreke-Ruhmer.